I was asked to update the SSL certificates on a website that was hosted in Azure Web Apps. No problem I thought. Select the website you want to update. It took a short while to resolve this. I tried a few things like restarting the site & checking the staging slot, but I still got the error. 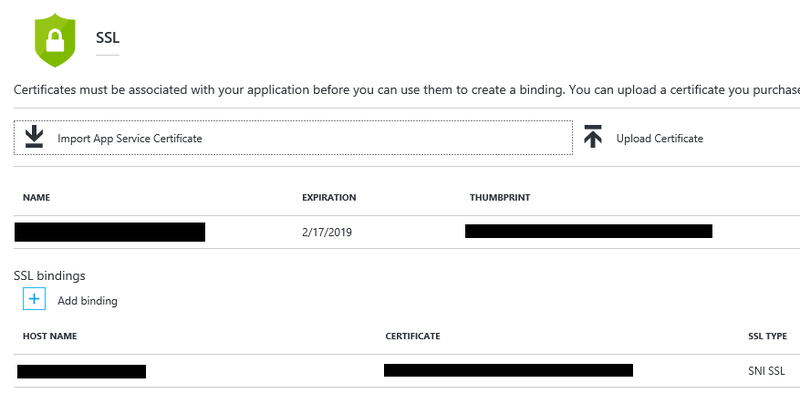 Finally, I checked other sites in the same app service plan and I had the same certificate used for another Web App (both using the same domain url). Once I removed the binding from that site, I could delete the certificate and upload a new one. I had to then add the new bindings to both sites. 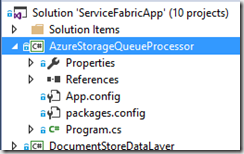 As part of a proof of concept for Azure Service Fabric one of the challenges was to migrate backend services from a variety of different places. 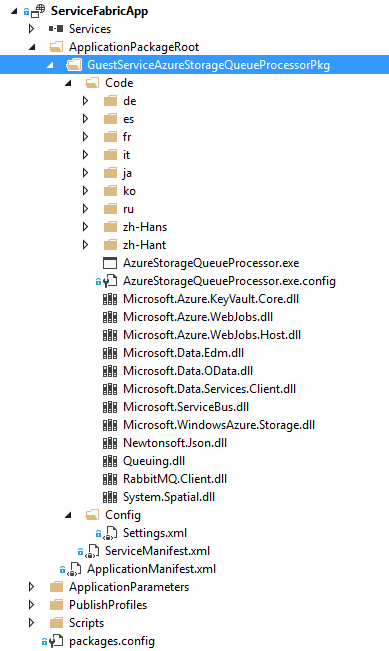 I had a number of services running as Azure Webjobs on the same platform as my web site. 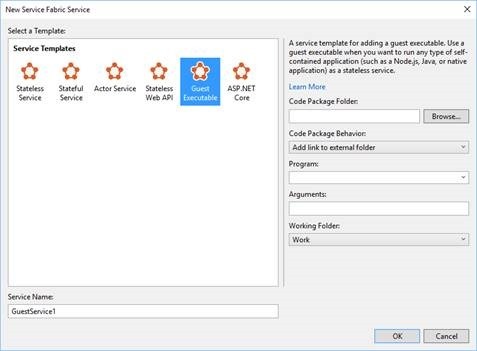 The WebJobs were hosted as triggered services meaning that they were using the WebJobs SDK and this has the advantage that the WebJob will run as a console application outside of the Azure Web site it is currently hosted in. 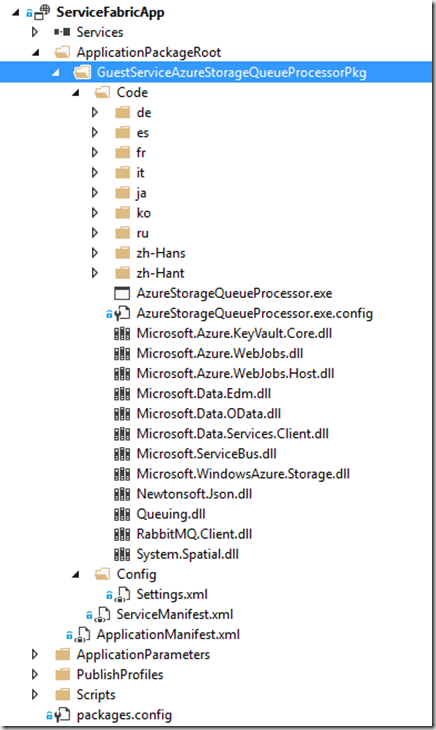 Azure Service Fabric has the capability to run any Windows application that can be run from a command line as a guest executable. This means that I could host my WebJob in Service Fabric as a guest executable. Once I had Visual Studio setup with the Service Fabric SDK & Tools. It was relatively straight forward to add the WebJob. Click Browse and select your WebJob executable folder. The WebJob executable should now appear in the Program drop down. Select this, change the service name and click OK.
Once deployed to a Service Fabric cluster, your WebJob should run as normal. If you leave the connection string settings the same as they are in the WebJob then your diagnostic traces will appear in the same blob container as they are now. 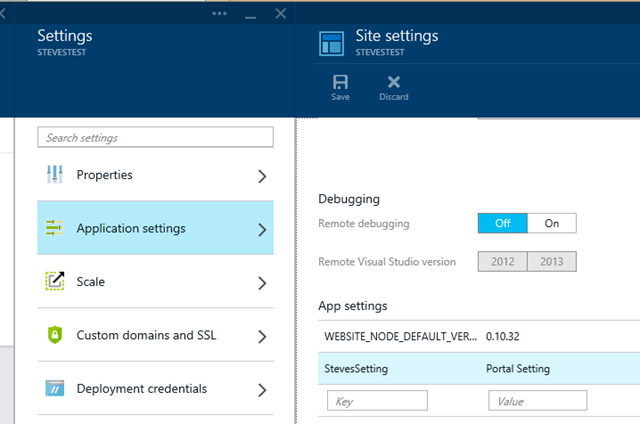 When using configuration in Microsoft Azure websites, ensure that you put configuration that you are likely to change often in AppSettings. This allows you to make configuration changes in the Management portal of Azure rather than having to edit the web.config file directly. An example of where you might like to do this include settings that allow you to disable site features temporarily such as during an upgrade or routine maintenance. Recently I’ve been looking at using traffic manager to front up websites hosted in Azure Websites. I needed to setup a custom domain name instead of using mydomain.trafficmanager.net. In order to use Traffic Manager with an Azure website the website needs to be setup using a Standard Hosting Plan. Each website you want to be included in the traffic manager routing will need to be added as an endpoint in the traffic manager portal. 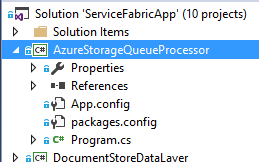 I’ve been setting up one of our services as the backend service for Azure API management. Part of this process we have mapped DNS to point to the service. 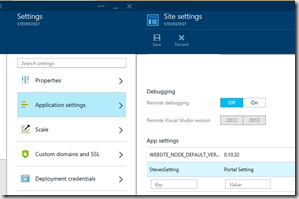 As the service is hosted in Azure Websites there are now two urls that exist which can be used to access the service. I wanted to stop a user from accessing the site using the azurewebsites.net url and only access it via the mapped domain. This is easy to achieve and can be configured in the web.config file of the service. Now if I try and access my site through the azurewebsites.net url, I get a 403 error, but accessing through the mapped domain is fine. 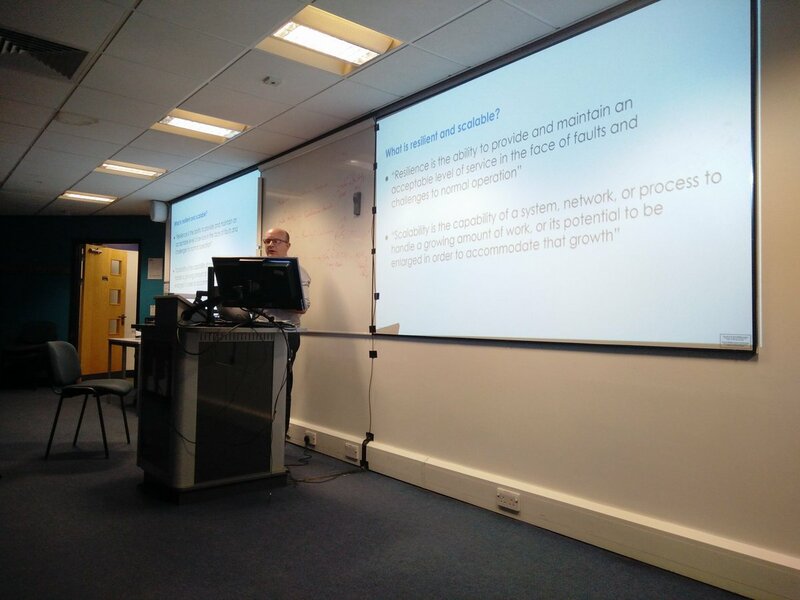 One of the conundrums we have with deploying sites to test means that there is often a lot of configuration that is needed on a test site that is different to a live site. There is also the time and risk of deploying a new instance into the production sites once testing has completed. 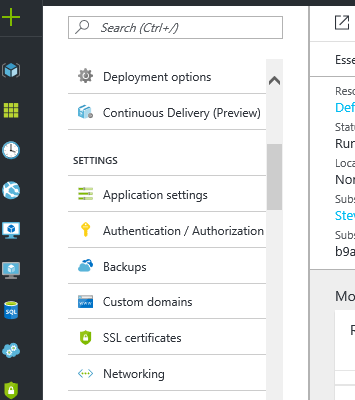 Azure websites has introduced deployments slots which allows you to have multiple deployments and swap between them in a similar way you could do with the production and staging slots in cloud services. Websites has the added advantage that you can have more than two slots and you can call them whatever you want. 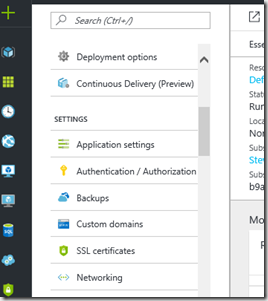 This setting can be overridden in the Azure portal(s) and these by default will follow the deployment and not stay with the slot. So in this example the "about" config will be set to "This is Now the Staging slot" and when the staging slot is swapped to be production, the new production configuration will also be "This is Now the Staging slot"
This is not necessarily what you want on production. Websites has a feature, that is currently unsupported by the management portal(s), which allows specific configuration items to become sticky i.e. they stay with the slot. There is a powershell cmdlet which allows individual appsettings to be marked as sticky and remain with the slot regardless of the deployment that is in the slot and they will also remain in the slot when the slots are swapped. After running the commands the example above will still have the configuration setting above, but once the deployment is swapped from the staging slot to production the configuration will remain on the staging slot. This approach should now allow us to deploy to a UAT slot with UAT configuration and allow the customer to test, when they are happy we can move the same deployment that has just been tested to the staging slot with production configuration and be tested in isolation to live to ensure that it works. When you are happy that the staging slot is working this can then be swapped out to production. When an Azure Website is created and is in production it will most likely be running in a Standard or Basic configuration. These are both sets of Virtual Machines and can be shared across your websites. In the old portal you could only scale the group of websites together but the new Azure Management portal now allows you to move your websites on to different virtual machines so that if one site is more heavily loaded than others it can be scaled out separately if required. The set of virtual machines is known as a Web Hosting Plan. If you want to move one or more of your websites to a different set of virtual machines then you will need to create a new web hosting plan for this. This brings up the Browse Menu. You can see that I only have 1 web hosting plan and it is currently hosting two websites. I would like to move them onto separate virtual machines so that I can scale them out independently. To do this I need to navigate to the web site I wish to move. The top menu needs to be expanded by clicking the 3 dots on the right of the menu bar. this then displays the web hosting plan button. I’ve selected a standard small instance to host my website. After clicking OK the new hosting plan will be created and the website moved to it. After a short while you should see that the hosting plan has changed in this website as well. 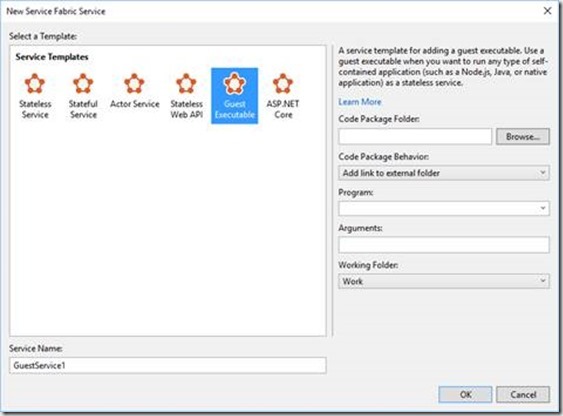 With the announcement of an upgrade to the webjobs service in Microsoft Azure service bus triggers to Topics and Queues were added. This got me thinking about how they could be used and there are a lot of scenarios where events need to trigger simple actions as well as running things off of a timer. Utilising Service Bus Topics along with a number of filtered subscriptions led me to create a simple workflow using Webjobs and Topics. They all point to my Azure Storage account. The way I set this up was to create a message class that contained the data that I wanted to send between states. This message class would be wrapped in a BrokeredMessage and I would use the properties to determine the state of the message. The message is then added to a Service Bus Topic. By setting properties on the message, I could create a number of subscriptions that had an SqlFilter applied which would allow the subscription to only contain messages of a specific type. Two things to note with the method above. Firstly, the ServiceBusTrigger requires both the Topic name and the subscription name in order to receive the filtered list of messages. Secondly, by adding the TextWriter you can then send logging information to the dashboard, which is useful when trying to diagnose the webjobs when deployed to Azure. I then setup a number of other methods for each subscription for each state. This allows me to perform whatever action I wanted to in each state. After carrying out the action I modified the message by changing the state property and then put it back onto the Topic. You can’t use the same brokered message so you either have to copy all the data out of the existing message and create a new one or you can use the Clone method on Brokered message (the easy option ). In my example I also added a delay to the Enqueue of the message so that I could see things progressing in order. The enqueue time of the message is the delay before the message appears in the subscription. This could be also be used as a delayed trigger if you needed something done after a specific time interval. I also achieve this by adding the data to a Azure SQL db and then using a scheduled webjob to check the db for expired jobs. I created a separate console application for this which looked for messages that were expired due to a specific start date being older than a certain time, sending an email using SendGrid and then marking the record as complete in the db. Webjobs made the actions easy to do and with the addition of the service bus triggers allowed me to have a fairly simple code structure to carry our a sequence of simple action (which is often what we need to do) without a heavy overhead of a workflow engine. It also utilised a hosting environment that I was already using.